My website was taken down by those whom wish to silence my efforts exposing a False Jesus. I love Jesus, and there is a ‘man’ who believes that he is The Returned Christ, Isa and Moshiach named Raymond Elwood Howard Lear who goes by the name of Lord RayEL, Ra-el. They want to silence me because of the information that I have researched highlights the shameful scam that they are peddling. So never, the defeatist, the best thing for me to do is to continue my work and publish my blogs and evidence via the way of THE CLOUD (Internet) where it can be duplicated, reblogged and shared more widely. “The people of Illinois saw him as the only incorruptible man alive, brave enough to fight against governmental corruption, so they pushed for him to run for Governor, Ra-el.org website. This is where is gets a little confusing, and unless you research their claims you could really take this at face value and believe them to be true. However, the above statement refers to his 2009-10 Campaign running for Governor in the state of Illinois, as a Libertarian Candidate. 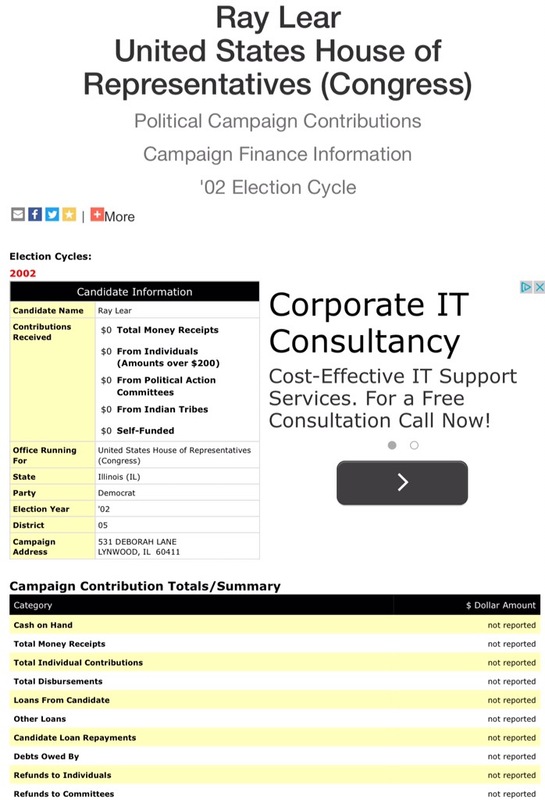 The Campaign video is the clue and click on the link embedded within this Libertarian Newsletter dated September 2009. This is well before he ran for Governor. So, the aim of this blog will identify the Campaign website of Ray Lear ‘The Angel’ and show you how they have twisted stories to make you believe he is a ‘good guy’, befitting of Jesus when in fact he lost fair and square his political campaign. Nobody believed in Ray in 2002, same can be said about today ! The Website was : – http://www.raylear.com. It was saved 33 times between July 13, 2002 and March 5, 2016. The Email for Contributions and Volunteers, and the email for the Ray Lear for Congress was RayLear@attbi.com This is an email address is connected to other online shams which I have discovered. Click here to view issues Ray will address in his first term. Examining the above (web page) starting with the links at the top of the page. Guardian Angels – that link connects you with their website. Under the press section, you can see all the articles that have been posted. You can trawl through these, and not one of them is related to Raymond Elwood Howard Lear. http://web.archive.org/web/20020720063557/http://guardianangels.org/. If you look carefully at the articles used, they are out of focus, the sources are unreadable and it rather looks like a collage. Now is a time like no other in American history. We stand against an undefined enemy that is not just overseas, but possibly in our own neighborhoods. An enemy without government or borders, or compunction when it comes to killing innocent civilians…. If we are to win this battle, we must strengthen our “front lines” here at home. #1) Street Gangs Federally Classified as DOMESTIC TERROIST. #2) A Civil Defense System for the new century. #3) An increase in Veterans Benefits. #4) Safeguarding the Social Security Trust Fund. Chicago’s Murder Rate is now the highest in the country!!! The murder rate is in direct proportion to the growth in Chicago’s Street Gangs. According to Michael Sheehan, the State Department’s coordinator for counterterrorism, the proceeds from street gang drug sales are being used to support international terrorist groups like Usama bin Ladin’s Al-Qaeda network. If we are serious about fighting terrorism on all fronts, then we must begin with the domestic variety. The simple truth is, street gangs are responsible for many times the death toll inflicted upon us by international terrorist, but that little figure is too often overlooked. Now that we have found this organic link to the international “axis of evil”, we must take the measures necessary to stop them cold. If elected, I will push for legeslation that will classify criminally organized street gangs as Domestic Terrorist Organizations, and bring down upon their heads, the full force of the Federal Government. A Civil Defense System for the new century. It may surprise you to know that our Civil Defense System is based on World War I technology, and hasn’t been majorly upgraded since the 1950’s. Some of you may remember the “duck and cover” bomb drills of the 50’s, where you were instructed to hide under your desk in case of nuclear attack (believe it or not). And the early warning system was the antiquated “air-raid” sirens that most people today wouldn’t recognize if they heard them. The plan for a new system- The proposed system would be based on military grade “Chemical Sniffers”, strategically placed in populated areas. This would give us an early warning in the event of chemical/biological attacks, and would work in conjunction with the present siren and TV/Radio Emergency Alert System. An increase in Veterans Benefits. I have been brought to tears, walking through Chicago, and seeing the number of Disabled Veterans living on our streets… When the most powerful nation on Earth cannot properly take care of its heroes, it disgraces us all. As we once again ask our young men and women to risk everything “Congress tries to cut 184 million in Veterans Health Care“. This transgression must not stand!!! If elected, I will fight hard for all those who have fought for us, AND I WILL NEVER BACK ANY LEGISLATION THAT HARMS THIS COUNTRY’S HEROES. We’ve been spending money fast and furiously over the last few months, and the once “untouchable” Social Security Trust Fund, has been dipped into very liberally. My plan is to put Social Security into a “Legislative Lock-Box”, effectively making it usable ONLY for its intended purpose. A very disturbing trend is happening in Illinois, multi-millionaires and those “anointed” by Chicago power-brokers have been quite literally “buying elections”, and completely circumventing the democratic process… During these very dangerous times, we must take back our democratic rights, and pick leaders that have “quality of character”, not just loads of cash. Have any of the other candidates actually done anything about crime, or just provided the usual “lip service”? After receiving his Honorable Discharge from the Navy, Ray put the uniform back on, and volunteers his time to provide mentoring to at risk kids in some of Chicago’s most dangerous neighborhoods… Have any of the other candidates demonstrated such a commitment to service and community? Ray’s experience, courage, and commitment to country and community makes him the ideal person to provide REALleadership in these very scary times. Usually you have to step into the voting booth, grit your teeth, and vote for the lesser of two evils… Not this time. This time you can “help the good guy win”!!! The fact is that ‘Ray Lear’ only managed to collect 1094 votes. On March 19, 2002 statewide primary elections list ‘Ray The Angel’ receiving 1079 votes. These links below, are copies of the political pages in respect of the campaign. RAY LEAR WAS NOT SILENCED BY THOSE IN POWER WHICH IS CLAIMED BY THE ECUMENICAL ORDER OF CHRIST. HE JUST LOST. Previous Previous post: Richard Ruff attacks Richard Shaw and SkywatchTV.